Anupam Ray met Ian Grillot and his family in the University of Kansas Hospital. 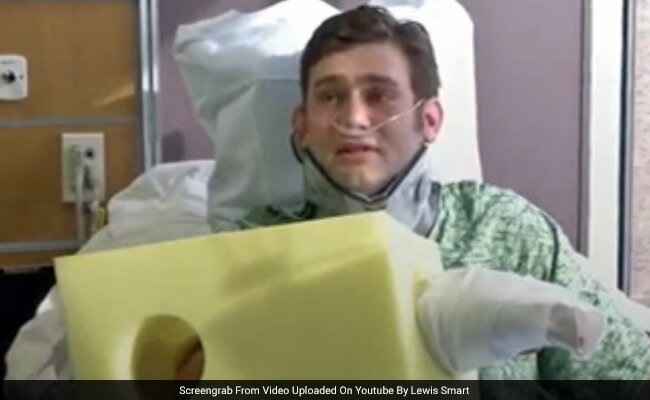 Houston: India has told Ian Grillot, the Kansas man who took bullets while trying to save Indian engineer Srinivas Kuchibhotla and his friend, Alok Madasani, that the people of India stand with him and wished him speedy recovery. The Indian Consul-General in Houston, Anupam Ray, met Mr Grillot, 24, and conveyed the message on behalf of Indian External Affairs Minister Sushma Swaraj. Mr Ray met Mr Grillot and his family in the University of Kansas Hospital and handed over the message from Sushma Swaraj. Mr Ray wished Mr Grillot a speedy recovery on behalf of the minister and the people of India. He also said that Sushma Swaraj has 7.3 million followers, who all conveyed their best wishes. "We will stand with you, whatever you need," Mr Ray said. Mr Ray also thanked the hospital. Earlier, the Hindu American Foundation joined Kansas Governor Sam Brownback, the Lieutenant Governor of Kansas Jeff Colyer and the Indian Consul General to discuss the February 22 shooting of Mr Kuchibhotla, 32, who died, and his friend, Alok Madasani, who was wounded, in an apparent hate crime. Mr Brownback said: "The hateful actions of one man don't define the US... Kansas welcomes and supports the Indian community." Mr Kuchibhotla and Mr Madasani, who were working as engineers for GPS-maker Garmin in Olathe, were shot at Austins Bar & Grill in Olathe, Kansas, by Adam Purinton, 51. A bullet hit Mr Grillot in the hand and entered his chest when he tried to stop Purinton, who has been charged with murder and attempted murder. On February 27, Sushma Swaraj had tweeted gratitude to Mr Grillot. "India salutes the heroism of Ian Grillot ! Best wishes for a speedy recovery." US President Donald Trump has condemned the killing of Mr Kuchibhotla, while House of Representatives Speaker Paul Ryan has offered the condolences of the House for the "senseless" murder of Mr Kuchibhotla. Indian Foreign Secretary S. Jaishankar, who is visiting the US, met Ryan and other senior Trump administration officials. Ryan, in a statement after meeting Mr Jaishankar, said: "In our meeting, I expressed the House's condolences on the death of Srinivas Kuchibhotla, who was senselessly murdered last week in Kansas. Our peoples must continue to stand together, and I look forward to working with Foreign Secretary Mr Jaishankar in the years ahead." Mr Jaishankar also met with US National Security Advisor Lt. General HR McMaster. On Tuesday, US President Trump began his first address to the Congress at the Capitol Hill by condemning Mr Kuchibhotla's death, saying the country "stands united in condemning hate and evil".